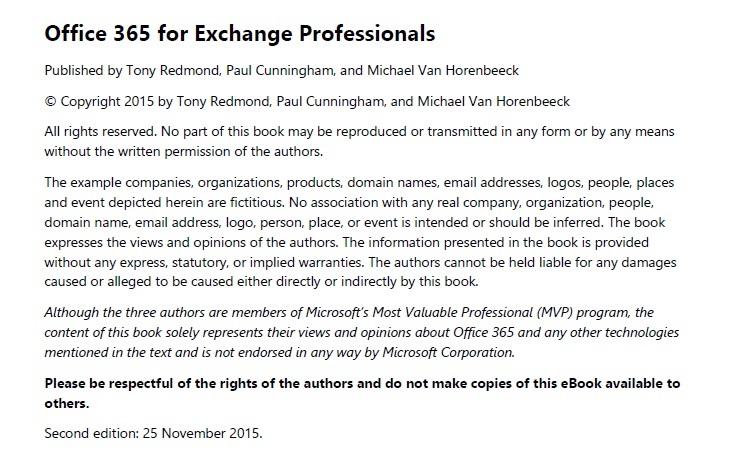 One year after we started to write the book, several thousand people have copies of “Office 365 for Exchange Professionals”. We are delighted at the feedback and positive comments that we have received. However, some questions have arisen as to how often we update the text and what right anyone has to receive an update, so here’s some information about editions and updates in an attempt to clarify the position. The books are available online in EPUB (suitable for Sony Readers and iPads), PDF (best for PCs and Macs), and Amazon Kindle. Each edition includes a substantial amount of new material to reflect new functionality introduced by Office 365. For example, the second edition has some 270 pages of additional material compared to the first book. As an indication of what we’re thinking about for the third edition, it will cover material such as Delve Analytics and the Office 365 Planner, both features that have not yet been released by Microsoft. In addition, we will revise coverage of the existing content to remove redundant material and to add, expand, or correct information as required. We know that many changes are coming for Office 365 Groups, so chapter 7 is likely to be overhauled (again). We are also consider changing the chapters for the third edition to create a more coherent flow. Purchase from ExchangeServerPro.com and become a site member. We can then update you when new versions and updates are available, providing that you opt-in for these notifications. Purchase the Kindle format from Amazon.com (or one of its country subsidiaries). Note that both the first and second editions are available on Amazon. The first is priced higher than the second and its descriptive text makes it very clear that this edition is now obsolete. We have kept the first online to retain the reviews as you cannot transfer reviews from one book to another. Receive a copy from our sponsor (Binary Tree) or from a company who buys some copies to distribute to their customers. For example, Microsoft is currently providing copies to select attendees at its cloud roadshow series and Mimecast has bought copies to provide to webcast attendees. It is important to know that we update the current book on an ongoing basis. We do this to remove “bugs” (in this case, bad grammar or spelling errors), address errors that are found or caused because new information comes to light, or to add some important information that we feel should be in the book. This approach matches the ongoing development that occurs within Office 365. The current version is indicated by a date on the inside cover (see screen shot below). The most recent version (for the second edition) is dated 20-May-2016. If you buy from ExchangeServerPro.com, you can download free updates for the edition that you purchase from the site. Free updates are not available to people who receive copies distributed by third parties. We provide updated content to companies who buy from us in order that they distribute the latest available text, but we don’t have a way to reach those who receive books in this manner thereafter. It is also worth noting that if you buy direct from ExchangeServerPro.com, we will offer you discounts as new editions appear. For instance, site members who had bought the first edition received a limited-time offer to buy the second edition for $10 instead of its full price of $44.95. I hope that this clarifies the way that we organize editions and updates and helps you find the most up-to-date content. This entry was posted in Exchange, Office 365 and tagged Exchange Online, Office 365 administration, Office 365 book, Office 365 eBook, Office 365 for Exchange Professionals. Bookmark the permalink. Would someone kindly explain what I need to do? The app is on Android, if that makes any difference. I have not done this in a while, but that is my recollection of how things should work. I have the first edition of the eBook but I could not get the second edition. Now how can get a discounted upgrade from first one to the Dec Edition. Discounted upgrades are time-limited (usually for the two weeks after we release a new edition) and offered only to site members. We are not currently offering discounted upgrades. The December version (16 Dec 2015) is an update to the 2nd edition (September 2015). If you are a site member of ExchangeServerPro.com, you will receive email notifications of future upgrade offers. Do you have an updated date when the 3rd edition will be available now that we are approaching end of May here 🙂 I am looking to order the latest one given the current version has been out for quite some time and not too keen on upgrading too soon again. Within the next two weeks. Definitely. Hi, I have the first edition w/ minor updates from 19 June 2015. Can I get an update? That’s a really old version. To answer the question, we provide updates to paid subscribers of each edition. You have a copy of the first edition and we are now issuing updates for the third edition. I am afraid that you will have to buy a copy of the third edition to resume receiving updates. There’s about 400 extra pages in difference between the first and third editions (current update of 5 November 2016). Yes, October 2015 is a long time ago now (in time and especially in Office 365 time). I think the book was about 600 pages then? Now, it is 1,050 pages and includes coverage of all the changes and updates in those 22 months, including major new applications like Teams and Planner. I have the Third Edition do I also need to re-purchase the fourth Edition? If you want the fourth edition, yes. Basically, we operate a subscription model. You buy a book (which is great value), but we also throw in updates for as long as the edition is “in print.” That’s usually a year after first release. You get all the updates free of charge. If you want to upgrade to a new edition, you must pay an upgrade price (which we make available to previous buyers in the first two weeks after a new edition is released) or buy the new book. Again, once you have the new book, you have all the updates for that book while it is still available.